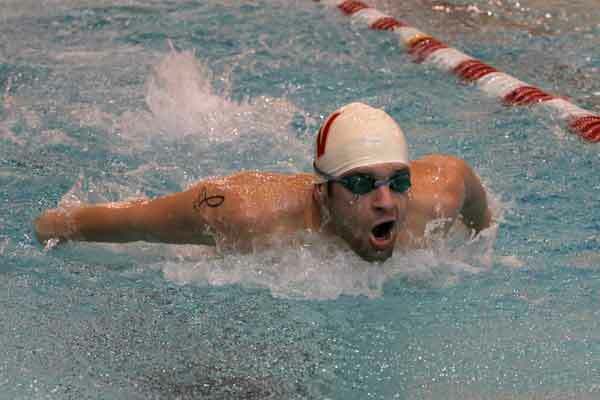 Fourteen top-five performances guided the Wabash swimming and diving team to a fourth-place finish at the annual Patrick Woehnker Memorial Invitational held Friday and Saturday at the Class of 1950 Natatorium. View photos from the meet here. Freshman David Phillips paced Wabash with second place finishes in the 1650 free, the 400-yard individual medley, and the 500-yard freestyle. He was also part of the Little Giants' fourth-place 800-yard freestyle relay team of Phillips, Chad Woods, Logan Rice, and Charles Williams that finished with a time of 7:24.61. Phillips touched out in 16:51.83 in the 1650 free on Friday night, then followed with a time of 4:19.29 for his second place finish in the 400 IM. His time of 4:51.10 was good for second place in the 500 free. Adam Current (left) finished second in the 100-yard butterfly with a time of 51.90. Teammate David Birrer was fifth, finishing in 53.46. Jake Schild took second on the three-meter diving board, scoring a total of 154.55 points. Jacob Anderson took fourth place with a score of 120.20. Schild was also third in the one-meter diving competition with a score of 209.35. Evan Rhinesmith added two third-place finishes. His first came in the 100-yard breaststroke, finishing in 1:00.19. He added another in the 200-yard breaststroke (2:16.36). Williams touched in fifth place in the 100-yard backstroke with a time of 56.19. Eric Vaughn, Rhinesmith, Current, and Williams combined to finish third in the 200-yard medley relay with a time of 1:38.93. Alex Beck, Vaughn, Williams, and Rhinesmith took fifth place in the 200-yard freestyle relay. The University of Indianapolis won the men's competition with a total of 661 points. DePauw was second (594 points), followed by Carthage (501) and Wabash (430.5). Wheaton (296.5) and Rose-Hulman (276) completed the team scoring. The Little Giants return to action at the Calvin Invitational to be held December 2-4.